Starting his career as a model, Kim Woobin is now one of the top Korean actors, leading the Neo Korean Wave all over the world. Based on the consecutive succsess of television series, School 2013 and The Heirs, an endless demand for him has lead to 2015 Kim Woobin Asia Tour. minimalist has carefully interpreted the true side of himself and developed the Artist Identity, then designed the whole merchandise goods. 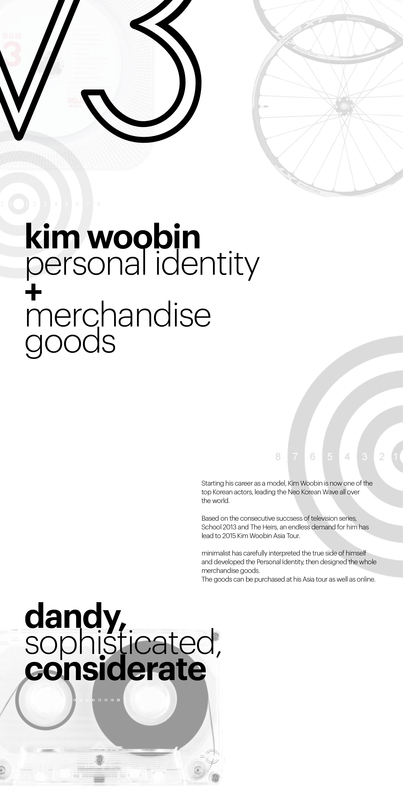 The goods can be purchased at his Asia tour as well as online. 모델로 그의 커리어를 시작한 김우빈은 지금 명실공히 신한류를 이끄는 최고의 배우 중 한명이다. TV드라마 '학교 2013'과 '상속자들'들의 연이은 성공으로 그는 '2015 김우빈 아시아 투어'로 아시아 전역 그의 팬들과 소중한 시간을 가진다. 미니멀리스트는 배우 김우빈이 아닌 인간적인 그가 가진 내면을 바탕으로 아티스트 아이덴티티를 개발하였고 머천다이즈 굿즈를 디자인하였다. 굿즈는 아시아 투어와 온라인에서 판매가 되고 있다.